Review posted June 6, 2014. Chicago Review Press, 2013. 177 pages. Here is a fabulous overview of great artists and their work. I ended up reading it by looking at one artist per day. There are seven sections: Studying Nature, Exploring Places, Examining Portraits, Telling Stories, Observing Everyday Life, Questioning Traditions, and Playing with Space. Each section features several individual artists, with more than 50 featured in the book. Each artist gets four pages. First, a title page, filled with the detail of the featured piece of art. When you turn the page, you get an oversized double-page spread that includes a picture of the entire work of art, usually a picture of the artist, and information about the artist and what they did that was notable in the work of art. Sometimes more than one work of art is included. The final page on each author has either “explore more,” “try this,” or “another view.” “Explore more” looks at more of the artist’s work and suggests a way kids can explore that idea. Some examples are “Keep a cloud journal of your own” or “Make a self-portrait.” “Try this” also springboards from the work of art to project ideas. Examples here include “Create a colorful collage” or “Leaf rubbing.” “Another view” takes a look at another artist who did something similar to the featured artist. The text compares with the original artist and gives the reader a broader view of that trend in art. This book is fascinating, beautiful, and informative. The cover explains that it includes 40 activities, so it is also inspiring. 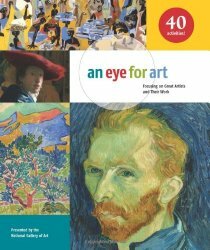 This is a wonderful book for a school library or a home collection or anyone who’s interested in art.